Aiden seemed to have been in love with all things that speed since, well, he was born. Seriously. I don't mean to sound stereotypical, but he is certainly all boy. For his last birthday, when asked what he wanted as a gift, he politely replied, "a red truck." And every morning, before we leave for preschool, he rummages through his "cars" bin in order to find the perfect set of wheels because, according to him, "Today, I have to show all of my friends this car." And everyday he picks a different car. Go figure. 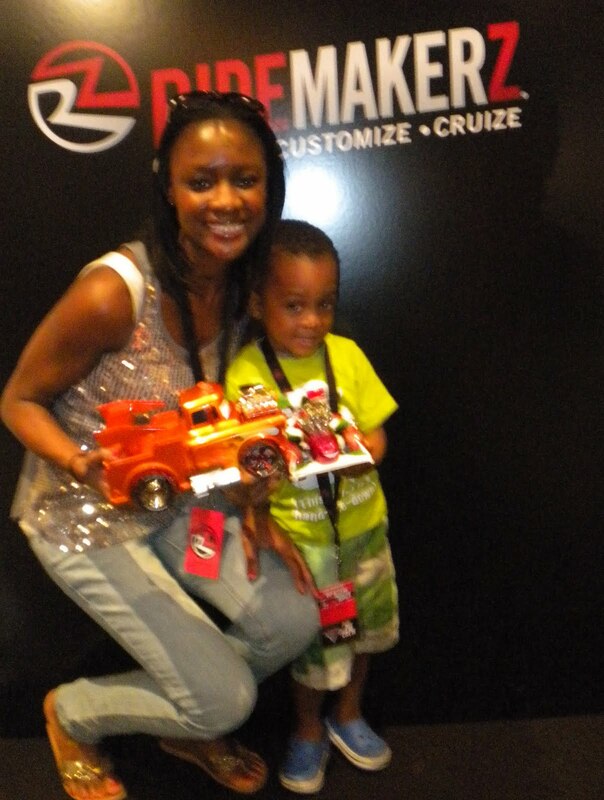 Imagine our excitement when we were invited to a RIDEMAKERZ event last weekend at Toys "R" Us in Times Square. As you already know, Aiden and I love the movie Disney Pixar Cars and we were super psyched about the premiere of Disney Pixar Cars 2 (read my interview with Larry the Cable Guy, the voice of Mater, here), so the chance to join the "Pit Crew" and build our very own Disney Pixar Cars 2 toy car was just delightful. After all, what better way to celebrate the premiere of one of our fave flicks?! RIDEMAKERZ has five nationwide locations and is also available within select new-format Disney Stores and Toys "R" Us stores nationwide. 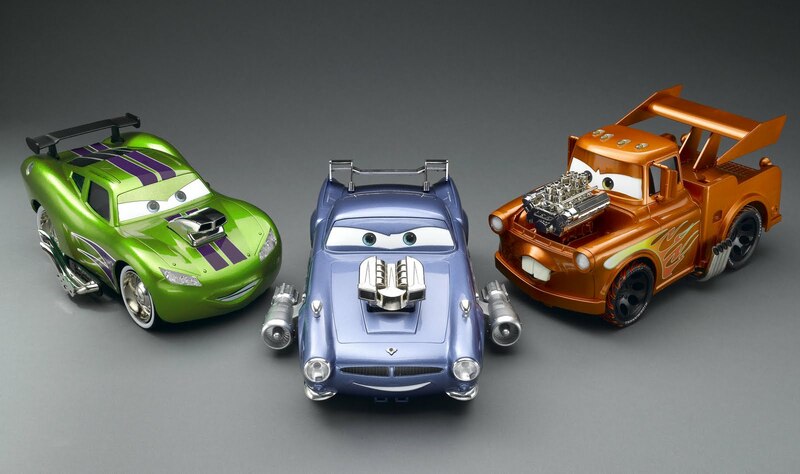 And with its new line based on the characters from Disney Pixar Cars 2, RIDEMAKERZ is going global baby! With their custom kits (starting at $19.99), RIDEMAKERZ now allows kids to customize Lightning McQueen, Mater, Master Spy Finn McMissile, and Formula Racer Francesco Bernoulli. Kids can pick from a variety of options such as tires, wheels, blown engines, hood scoops, side pipes, spoilers, and more! Get excited, folks! There is also a RIDEMAKERZ Cars 2 Snap 'N' Go line available at Toys "R" Us so that children (ages four and up) can build their fave Cars 2 characters at home and make them uniquely theirs. For more information, check out the RIDEMAKERZ website or find them on their Facebook Page. Thanks to RIDEMAKERZ for hosting such a fun event! That is awesome and looks like so much fun! Go aiden! You get Aiden the best hookups!He looks over the moon! ps voted foe ou over at circle moms. good luck! Awwwwwww, there's nothing more beautiful than a happy child. I just voted for you, all the best! Such wonderful miniatures. It would be great to be a child again. Aidan looks beside himself! So happy to share this fun event with you guyz! Those are too cute, my son is the same way. I'll have to check to see if those cars are at my local store. Aiden probably came home talking your ear off after bringing that car to school! so cool that they were able to customize their own cars.. love it.. Nice!!! That must have been super fun!! DIVA SIDE NOTE: Love that tank you're wearing! My son is INFACTUATED with Cars. Niccee! My guy is a collector of high end cars, antiques and match box cars. We're willing to share with Aiden and clutter your home, lol.